The Kingswood Oxford varsity ice hockey team celebrated its senior class on Saturday on Senior Day against Rye Country Day. The senior group of Michael Autorino ‘19, Calvin Beck ‘19, Jack Gao ‘19 and Garth Swanson ’19 have helped the Wyverns to a strong season that has included a season opening overtime victory over King School and a Hockey Night rout of Hamden Hall. 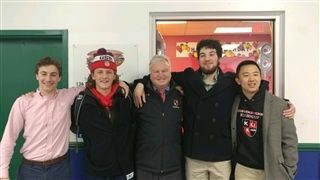 “It is hard to believe we are at the end of another KO Hockey season, sending off four of our graduating seniors on the path to college,” Kingswood Oxford coach John Hissick said. “I’d like to acknowledge the contributions of Michael Autorino, Calvin Beck, Jack Gao, and captain Garth Swanson for their contributions to our program over the last four years.